Carloway Football Club is an amateur football club based in the village of Carloway, 6 miles west of Breasclete, on the West Side of Lewis. The club fields players drawn from across Lewis including many young players from our area and competes in the competitions organised by the Lewis and Harris Football Association.. These are the 9-team Lewis and Harris League and the following cup competitions: Acres Boys Club Cup, Jock Stein Cup, and Lewis Cup. It also participates in the Co-op Cup, which covers all of the Western Isles; the Highland Amateur Cup, which covers all of the North of Scotland, and the Eilean an Fhraoich Cup, a competition between the villages of Lewis and Harris.The football season runs from April to September each year. It also participates in the locally run junior competitions at Under 14, Under 16 and Under 18 age levels. Junior players from both the Carloway and West Side catchment areas are pooled, and play under the name Western Thistle. Back row: Donald “DI” Maclennan; Calum “Tom” Moody; Kevin “Gochan” Macleod; Calum Mackay; Murdo “Squegg” Macleod; Gordon Craigie; Seumas Macleod; Kenny “Beag” Maclennan; Kenny “Dokus” Macdonald; Gordon “Tago” Macdonald; Kevin Anderson (Asst.Manager and midfielder); Peter “Dokus” Macdonald. 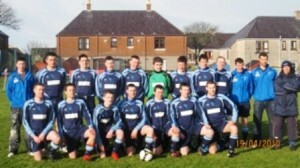 Front row: Andrew “VP” Macleod; Ed Ansell; Dan Crossley; Donnie Macphail; Archie Macdonald; Darren Mackinnon; Domhnall Mackay. Taken at Goathill Park, Stornoway, on the evening of 19.4.10, before a 2-3 defeat to Athletin in the second round of the ABC Cup. Missing from photograph: Scott Macaulay; Donald ‘Tocan’ Chisholm; David ‘Cirbhig’ Macleod; Calum Fraser; Andrew “Tago” Maciver; Benn Esslemont; Gordon “Gordy” Mackenzie; Calum Macleod.